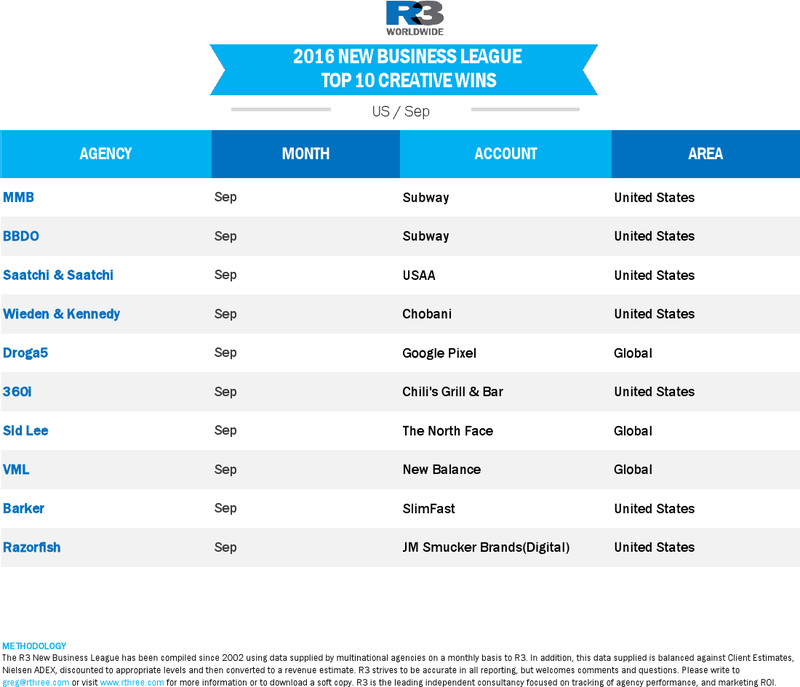 The Subway win helped Omnicom's network maintain its hold on the top spot for another month. 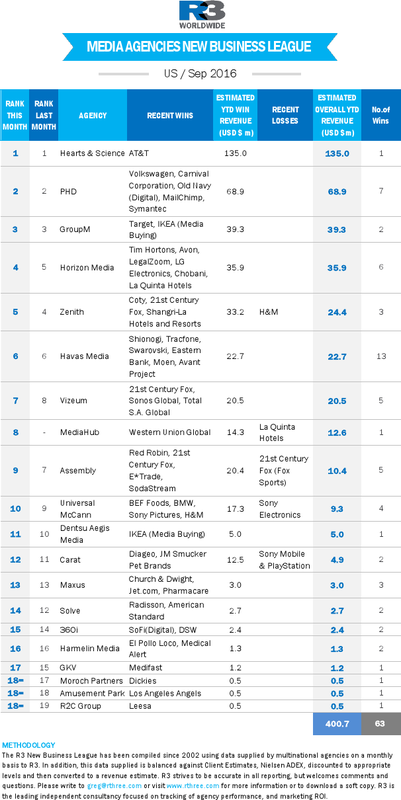 Among creative and digital agencies, the only change in the Top 10 global leaders for September is VML, which moved into 9th place courtesy of the global New Balance win and the Electrolux US win. Droga5 and Sid Lee also claimed global wins with Google’s new Pixel Phone and The North Face, respectively. 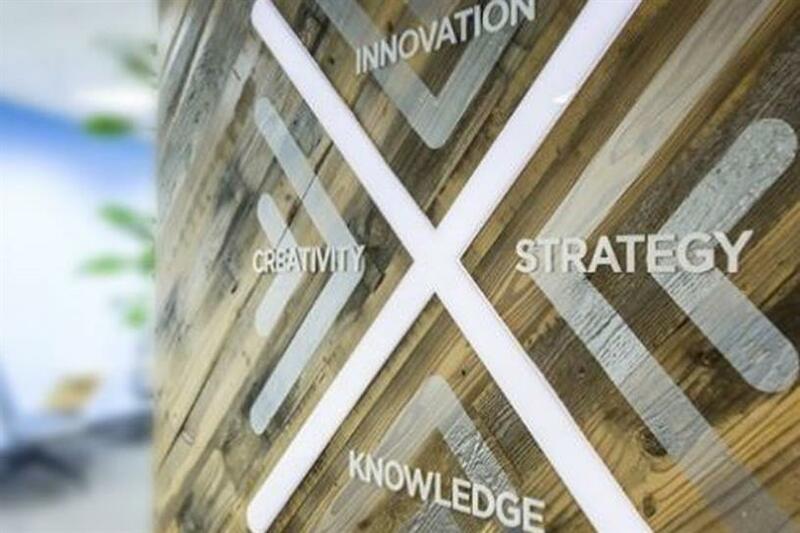 Among media agencies, Mindshare moved up significantly with a large collection of wins across all continents. 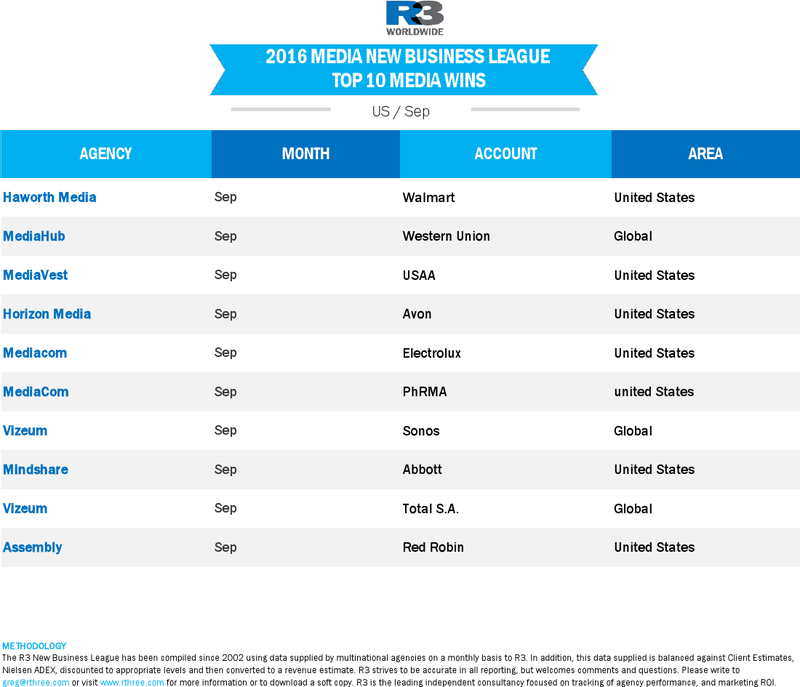 Mullen Lowe’s Mediahub picked up the Global Western Union business and MediaCom took more P&G business in China. In the US, BBDO held on to the top spot for September with wins including Subway, which it shared with MMB. Saatchi & Saatchi also moved up on the back of some consistent results. Looking to media agencies, it was the Western Union win that pushed MediaHub into the top 10. Haworth Media also picked up the Walmart business to offset its Target loss earlier in the year. Horizon Media moved up a spot on the back of their Avon win. BBDO maintained top spot with more wins this month including Subway, which is shared with MMB. Saatchi & Saatchi also moved up on some consistent results. Looking to media agencies, it was the Western Union win that pushed MediaHub into the top ten. Haworth Media also picked up the Walmart business to offset its Target loss earlier in the year. Horizon Media also moved up a spot on the back of their Avon win.